Last week we looked at the idiosyncrasies of the general excise tax with respect to its application and the differences between it and its counterpart on the mainland, the retail sales tax. 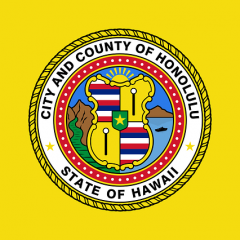 One of the provisions of the general excise tax law directs businesses that make sales in more than one county to report and file their gross income for general excise tax purposes in the First Tax District or Honolulu. Whether or not one wants to argue that this is a hold over from the “good old days” when Honolulu was the center of the earth for the territory, there is an even more important reason for multi-county businesses to report all of their gross income in the First Tax District. This reason became increasingly apparent when some counties wanted to know how much money their businesses were contributing to the state treasury relative to what they were getting back in the way of state expenditures. The problem became even more apparent when lawmakers proposed allowing the counties to raise the general excise tax rate. The impetus for this proposal was the financing of a mass transit system for the City & County of Honolulu. The problem? Where does one report the transaction if the business operates in more than one county? Since the tax is on the business, as we learned last week, one would think that if the business is based in the county with the higher rate, the higher rate should apply. But from a benefits perspective, why should someone who orders a stove from a business in Honolulu for his or her home on Kauai have to pay the higher rate imposed on the business just because it is in Honolulu? It becomes even more complex when one talks about services. How does a lawyer who has his or her office in Honolulu, where a higher rate may be imposed, bill a client on Maui for drawing up a contract or perhaps a will? The lawyer may actually fly over to Maui to visit with the client so that the contract or will can be drawn up to reflect the wishes of the client. However, the lawyer returns to Honolulu and actually drafts the contract in the Honolulu office. What should the lawyer do in billing the Maui client? Should the 4% rate be charged since the client is on Maui or should the proposed higher general excise tax rate be charged because the lawyer does the actual work in Honolulu? With the retail sales tax on the mainland, the problem of billing for services doesn’t occur because services are not taxable under the retail sales tax. And since the retail sales tax is not an impost on the business but the customer who purchases the goods, the determination is simple as the applicable rate is where possession of the goods is taken. Thus, with a single rate across the board and with the requirement that businesses making sales in more than one county report their gross income in Honolulu, makes for simple and cost efficient administration of the general excise tax. However, doing so creates a problem of perception. If a novice unfamiliar with the reporting requirement, say someone from the mainland, took a look at the reports of the collection of the general excise tax, he would probably observe that more than 80% of all the business is done in Honolulu based on the amount collected in terms of the general excise tax. While there is no definitive way of disproving that observation, one has to consider that many of the businesses reporting in Honolulu may be reporting gross income from sales of goods and services in the other tax districts. However, because there is no requirement that businesses segregate their gross income from where is was received, one cannot – with any great certainty – say that only a portion of the 80% of collections is attributable to some county other than Honolulu. True, the legislature could probably pass some sort of law requiring businesses to assign or segregate where the gross income is generated, but that would make the general excise tax a highly inefficient tax to collect as legions of scriveners and forests of trees would have to be utilized in making the determination of where to assign the earnings of that gross income. Thus, while the general excise, at first blush, seems like a relatively simple tax with which to comply and would seem relatively simple to administer, that is far from the truth.